As I sit here enjoying my cup of coffee and savoring the last few minutes of calm and quiet for the day, I just wanted to give a big THANK YOU to all the parents around the world who are taking kids to athletic events today. Thanks to all the parents who are working as a team – one taking a hockey player to a tournament up north and the other taking a gymnast to a competition down south. Thanks to all the parents who are helping out another family by taking their teammate to a game when a conflict has arisen. Thank you to all the parents who selflessly drive carpool to and from practice. 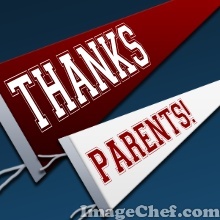 Thanks to all the parents who volunteer countless hours to make sure the competitions go off without a glitch. Thanks to all the parents who help make sure their athletes look just right on game day – right down to the perfect competition hairstyle. Thanks to the parent who video tapes my child while I volunteer at a competition. Thanks to the parents who collect the results and get them submitted to the newspaper. Thank you to all the parents who understand the true meaning of youth sports and cheer for every athlete – friend or foe! You see, parents are a critical part of the Athlete-Coach-Parent triad. It takes a team to build an athlete and parents are an important part of that team! Give yourselves a pat on the back for being supportive and keeping it in perspective. The lifelong benefits of kids participating in sports reaches far past the medal they do or don't get today.